High Speed Mixer has been designed to mix and blend a large mass of product in 3 to 5 minutes. This mixing machine has a rotor with two double thread spiral worms that convey the product by reverse spinning to mix and blend the different components into an homogeneous mixture in a few minutes. Our mixers also stand outs in the discharge operation, which can be easily performed either through a small outlet or through a discharge valve. 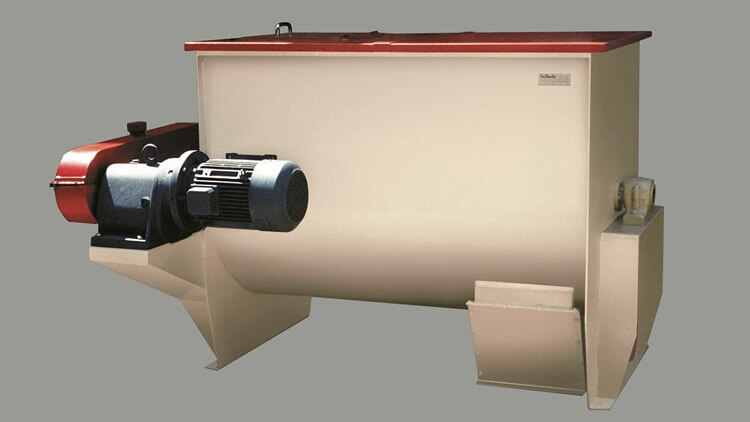 The blenders are supplied in two versions that allow a either a regular or a fast unloading. In the first version, the machine is completely unloaded in 20 seconds; while in the second version it is performed in only 6 seconds. The unique double spiral worm incorporated into the design assures exceptionally high degrees of homogeneity during the mixing and blending process. Thanks to its robust construction, Prillwitz´s mixer has become an essential item for mixing any kind of dry ingredients, including the abrasive ones (such as minerals) and those that are non-flowing such as flour. For those processes that need to exactly dose the ingredient to be mixed, Prillwitz supplies weighing devices as well as mixers with other control systems which permits to modify blending formulae. Finally, we also provide silos and bagging equipment.